Should you be concerned about your privacy on Facebook's recently announced "frictionless sharing" plan that lets online sites and services automatically share your activity with your Facebook friends? 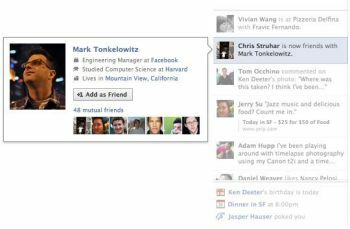 The basic idea behind Facebook's new sharing system is that clicking a "Like" button is too burdensome. So why not let a news site do the sharing for you, with almost no action on your part? All you have to do is authorize a new Facebook application such as The Washington Post Social Reader, The Guardian's new Facebook app, or Yahoo news. Then every time you read a news article online, your activity will automatically be shared with your friends. Think of it as silent sharing (at least, silent to you). Instead of clicking on a "Like" button, you need only click on an article link and your activity shows up in Facebook's new Ticker in the left hand column of your friends' Facebook home pages. The new functionality is reminiscent of Beacon, Facebook's now defunct over-sharing system that landed the social network in hot water in 2007. Under the Beacon plan, if you bought movie tickets from the Fandango site, say, Facebook would alert your Facebook friends. The problem with Beacon was that it was an opt-out program, not opt-in. So Facebook users had to explicitly stop Beacon sites from leaking their online activity back to their friends instead of being given the choice about whether they wanted to participate in the first place. Frictionless sharing is different from Beacon, since you must explicitly authorize a site or app to share your information with Facebook. How this sharing mechanism works depends on the app. Authorizing The Washington Post or The Guardian Facebook apps allows you to read those news sites right within Facebook. The downside, however, is that everything you read is shared back to your friends. Yahoo News works a little differently. The site has a function called "Social" that can be turned on or off. When it is turned on, frictionless sharing is in full effect, and everything you read is shared via the Facebook Ticker. Turn social off, and you're back to private mode, when only clicking on the Like button will send articles back to Facebook. The Wall Street Journal also has a new Facebook app that allows you to read the Journal's articles within Facebook, but you must click the "Like" button to share content. Interestingly, however, whenever you open up the WSJ Social app, your friends are alerted that you are now reading The Wall Street Journal. Facebook's new plans are not just for news services. You can use frictionless sharing to automatically share the music you're listening to through services such as Rdio and Spotify, share the movies and TV shows you watch via Hulu and Netflix, and reveal your fitness activity through Nike+. So, now everywhere you go, everything you do is being sent back to your Facebook friends and stored on company servers. Creepy, right? Maybe. But if you don't want your friends to know you love to read news stories about Lindsay Lohan or that you follow the details of every gruesome murder across the country, here's my advice: authorize wisely. Don't use the new social functionality in Yahoo News or the Washington Post or Guardian apps if you're concerned about your reading habits leaking out. Instead, use the traditional "like" buttons to manually select what you want your friends to see. If you do use automatic sharing apps, but want at least some control over who can see what you're up to, you can specify who on Facebook can see your activity. In my experience, most of these apps by default limit sharing to your friends, but you can also choose to share everything publicly or create a custom setting to only share with specific people. Let's say you want to adjust your settings for Washington Post Social Reader. First, go to your App Settings page in Facebook and then click on the app's name. This will show you all the settings for the app, including the information it can access from your profile and the type of profile data it last accessed. Toward the bottom, you will see a section called "App activity privacy," which will show you who can see your activity. Clicking on the button on the far left lets you choose to let everyone see your reading activity, restrict it to friends of friends, limit the information to your friends, or follow a custom setting defined by you. Once you select your preferred setting, hit the close button and you're done. But this method is not foolproof, because your friends could turn around and share your activity with others. Let's say you read an article on Yahoo News and it pops up in the ticker of your friend Richard. He can then turn around and share that article with his friends, and so on. So if you don't want people to see what you're reading or listening to, or how much you're running, the best thing to do is to keep it off Facebook.